Elessar wrote: Thalidomide did what it was supposed to do, and is now back in use in some cases because it's actually a very useful drug. The problem with thalidomide is that when it was mass-produced, a stereoisomer caused the horrendous birth defects. That was due to a manufacturing flaw. The correct drug itself was always fine. There have been examples (obviously!) of doctors getting it wrong though. There was a drug used to prevent heart attacks that caused loads of heart attacks. Bit awkward. The knowledge it was a manufacturing flaw wouldn't be of much use in convincing parents of those kids to trust medical advise again. Very. The problem with this is that it was doctor who originally connected autism and vaccines, and millions of doctors who said it was bull until he admitted it. So millions of people will believe the evidence, a tiny minority, like a tiny minority of doctors who would make the claim, believe the hysteria. Unfortunately now we have celebrities and the media. I think people should blame the appropriate people. If a doctor says you should take some antibiotics, and the pharmacist gives you arsenic, you'd be a bit unreasonable to blame the doctor. I think the theoretical link probably came before the Wakefield paper, given that he was funded by anti-MMR groups for a study that had nothing to do with MMR (it was a link between autism and colitis; the MMR thing came in a later, shittier paper that cited the Lancet one as evidence). I think they should too, but you can't apply rational thought process to parents whose children have been born with serious birth defects because of a drug you trusted. Non-medical people have to trust in things they have no knowledge of, and that's very scary. When that trust is shaken in the very severe shape of a disabled child, you can't expect them to trust medicine again. It's not blaming doctors, it's stopping trusting prescribed drugs. But we can't criticise her, she's just a poor mum doing her best for her kids. I really hope she is actually moronically doing what she thinks is right, the other option being she's an astonishingly cynical and malicious human being. Sadly its difficult to believe she actually thinks her son is 'recovering' from autism. This might fit in here...thoughts on this anyone? Most mental health conditions increase in frequency with increasing population density. Pollution is probably a proxy measurement for that unless they've controlled for it, eg in a particularly polluted rural area. I've no idea why mental illness should be more prevalent in cities, but my suspicion would be that it's increased diagnosis due to better access to healthcare as opposed to an increase in actual incidence. In other words, an autistic kid is probably more likely to be diagnosed if he lives in London than if he lives in the Himalayas. Its the mercury in the vaccines people are suspicious of. 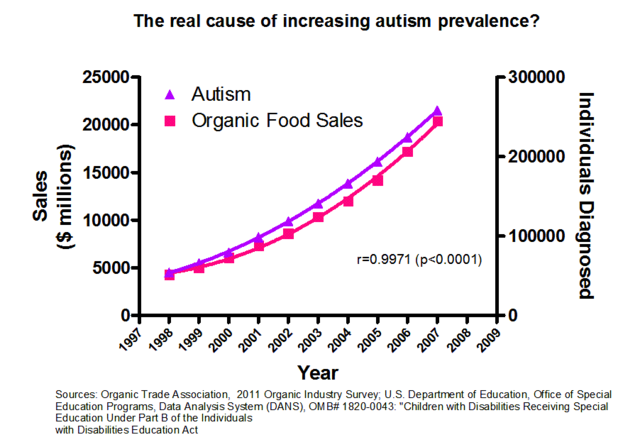 If that's the case, rates of autism should be higher in countries with high mercury consumption, eg Japan. They're not. They should also have fallen since it was removed from US vaccines (due to pressure from anti-vaxxers). They haven't. "Dear parents, you are being lied to"